Show off those pearly whites with this handy dental kit! This hygienic 4-piece kit includes a toothbrush with medium bristles, toothpaste squeezer, dental floss and toothpaste. All items come packed in a clear PVC case with white trim. This helpful product makes a great giveaway for dental offices, pharmacies, schools and the healthcare industry. 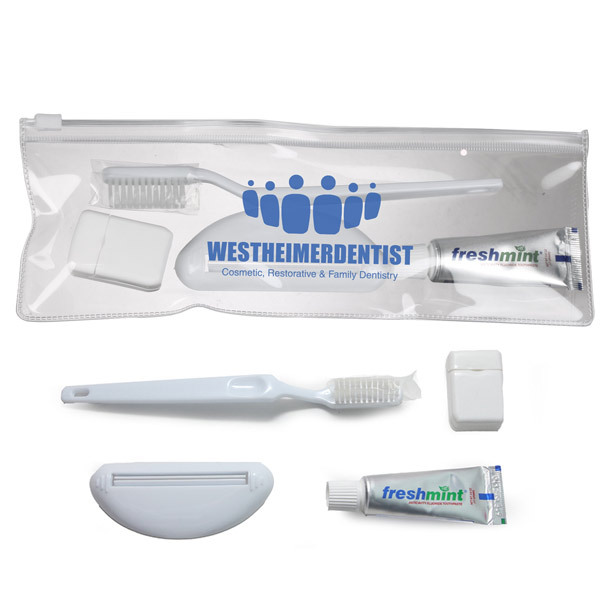 The slide zipper case, toothpaste winder, toothbrush and floss are all available for imprinting your company name or logo. Bulk / 44 lbs lbs / 200 pcs pcs.